"At the beginning of our Positive Behavior Support project, Safe & Civil Schools donated a START on Time! package. This school district won it. Here are data to support their use! Pretty impressive!" Note: These figures reflect the combined data from both the Middle School and High School. 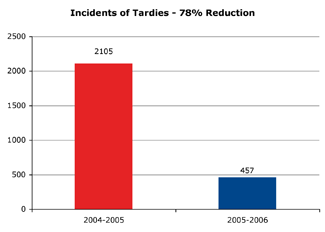 During the 2005-06 school year, incidents of tardies at Monticello's two secondary schools decreased by 78% from the figure measured during the previous school year.